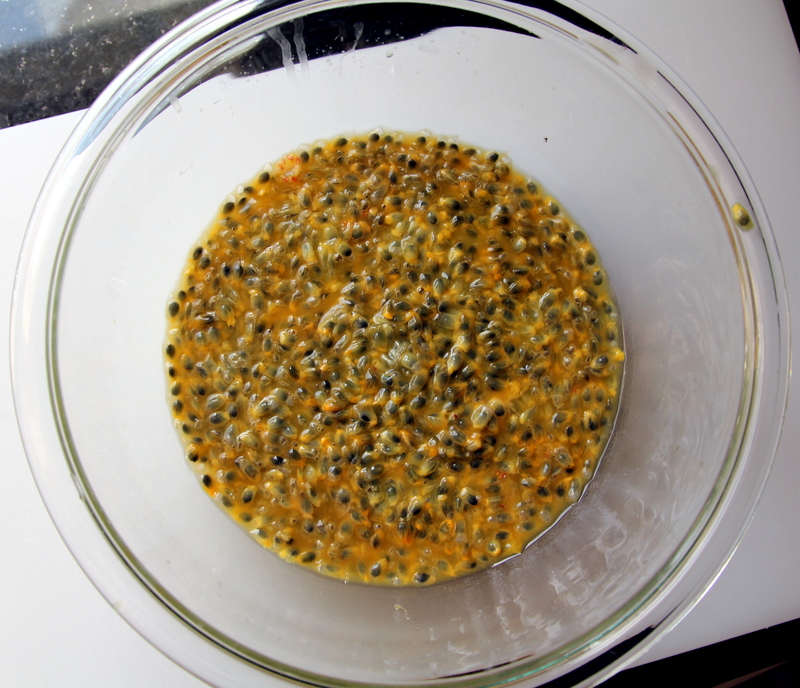 Passionfruit – Cin Cin, Let's Eat! 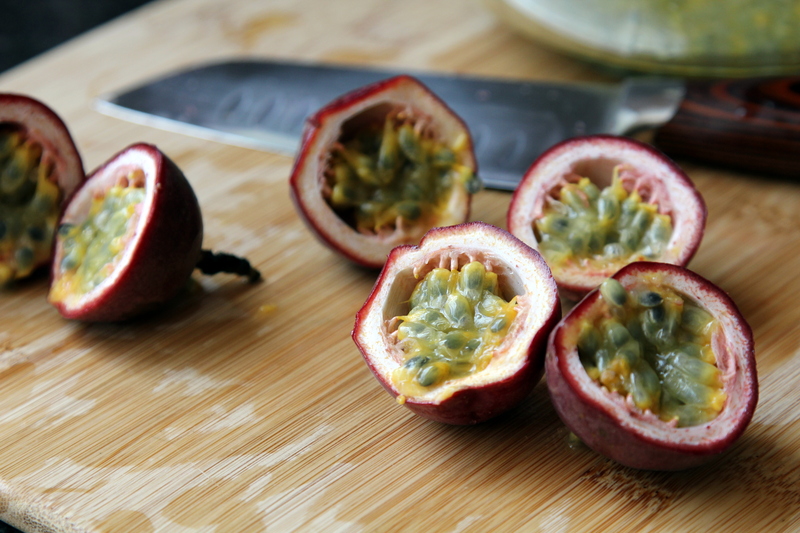 Passion fruit is something that’s very dear to my heart. 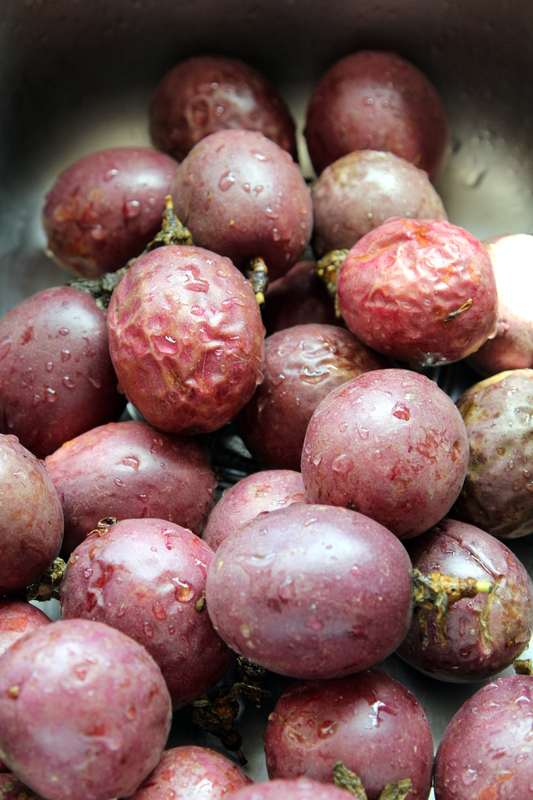 Growing up, we had a passion fruit plant on our rooftop garden in the Taiwan house. It didn’t last very long and didn’t bear a lot of fruit, but one of my earliest childhood memory was of me watching my grandpa peeling open the tough shell with his hands, digging out the yellow aromatic pulps. I, on the other hand, tried to prove that I was the brave one by eating as much sourness as I could withstand. Oh the ugly wrinkly faces I made! Since finding a really sweet fruit isn’t easy, I generally associate this fragrant fruit in juice form. It has definitely gained popularity in the culinary world, but still falls under the category of “exotic” tropical fruits, and most of the time restaurants don’t even use fresh pulp, but use the extract instead, resulting in an artificial taste. But one won’t really know the difference until quenching down a fresh glass of passion fruit juice. It is really pretty amazing. Okay, a passion fruit mojito may be better! Passion fruit isn’t widely available in supermarkets, but thanks to my aunt who grows a huge tree in Southern California and my cousin who goes to visit frequently, we get a garbage bag full of ’em once or twice a year. Spend a little bit of time to scoop out the pulp, freeze them in ice cube trays and we can have tropics-in-a-glass all year long. Scoop out the pulp into a clean bowl. If you’re freezing it for later use, place them in ice cube tray. Once frozen, store the cubes in an airtight container. Defrost before use. Place the pulp into a blender, pulse for few times until the black seeds break loose. If you blend for too long, the bitterness of the seeds will affect the taste. strain the mixer through a fine sieve, and voila! you now have a very intensely-flavored passion fruit concentrate. To make a simple and refreshing drink, simply use a 1 to 6 ratio, concentrate to water (use 1 to 5 ratio if you like a even more tart taste), sweetened it with sugar, simple syrup, or honey. Refreshing! Optional: muddle some mint leaves with the sugar, or use sparkling water instead of regular H2O, or muddle some strawberries, or mix with other fruit juices like pineapple or OJ, or like I mentioned- MOJITOS!….endless possibilities! inspiration! fantastic ideas and awesome post! do you have photos of those wrinkly faces? i want to see! i guess the less-wrinkly the fruit, the more sour the taste, and the wrinklier your face! Pingback: Farewell Summer BBQ: Hot Dogs + Grilled Corn, with a Twist! [recipe] « Cin Cin, Let's Eat!